Welcome back to another “How-to” guide from the Home Flooring Pros. This week we’re going to look at the age old question of how to make hardwood floors shine. When you first install hardwood flooring it has that never been stepped on brilliance that you’ll be familiar with from all the interior design magazines and websites, but it doesn’t take long for that shine to fade. So how do you clean hardwood and in particular how do you get hardwood floors shiny again? Hardwood floor finishes range from a light-reflecting gloss to a more subdued satin or matte that shows off the wood’s grain. Any finish needs regular care to maintain its beauty. Let’s start with how to clean a hardwood floor to make it shine. If you try these hardwood floor cleaning tips and they don’t restore the shine, then re-coating or refinishing hardwood flooring are the next steps to consider. We have a dedicated guide to hardwood refinishing costs. When the finish is in good condition, these hardwood floor cleaning steps will restore their shine. Spot-treat stuck-on food and dirt: A few drops of water used to soften stuck dirt is preferred to a harsh cleaner or scrubbing tool. Sprinkle a few drops directly onto the spot, wipe away the dirt with a soft cloth within five minutes, and dry the floor. Get the loose dirt off daily to weekly: Not only does dust and dirt make a floor dingy, walking on the debris will slowly but surely scratch and dull the finish. A dry microfiber mop is preferred for loose dirt, but one slightly damp works well for lightly-soiled floors. There are several quality microfiber mops with washable heads, and some are part of floor care kits that include a bucket and spin mechanism to remove excess water. If gaps exist between planks, use a hard-floor vacuum or lightweight multi-surface vacuum with the rotating brush turned off before mopping. This step should be done at least weekly in homes with a “shoes off” policy, more frequently when shoes are worn inside. In a bucket, add warm water and white vinegar in a 16:1 ratio, or about 1/4 cup of white vinegar per quart of water. Swirl the water to mix thoroughly. Dip your mop, and wring it thoroughly. A sponge works well too, but you’ll have to do the work on hands and knees. Mop areas you’re comfortable working from one position, perhaps 2-3 feet in front of you and 4-6 feet side to side. Rinse the mop head in fresh water or change it when it’s noticeably dirty. If you opt for a hardwood floor cleaner, make sure it is one approved by the manufacturer of the hardwood flooring, if possible, or recommended by a flooring expert you trust. If you’re not sure what finish your floor has, avoid wax. If you suspect a buildup of wax is dulling the floor, then mineral spirits ($10/quart or $25/gallon) on a cloth followed by wiping with a clean, damp cloth might work without harming the floor’s natural finish. If you can’t get the wax off or the mineral spirits harm the floor’s finish, you’re left with the more aggressive options discussed next. Recoating the floor: This involves lightly sanding the surface, cleaning it and applying a new coat of finish. This is a good option when the floor is generally free of deep scratches and stains. Refinishing the floor: This involves sanding away the surface including stains and scratches, cleaning it and applying one or two fresh finish coats. This is the only option for badly marred hardwood flooring. 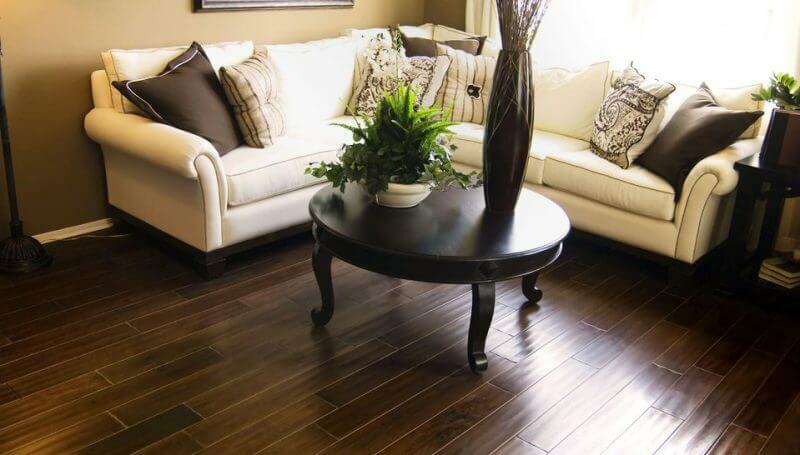 Visit our hardwood flooring cleaning and maintenance page for more options.